An album is a sound recording format first used in gramophone (phonograph) records, and later in other analog recording and digital recording media. 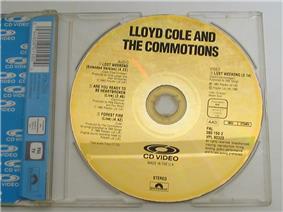 Audio albums in physical form often have decorative covers and liner notes, and sometimes other background information such as analysis of the recording, and lyrics or librettos. 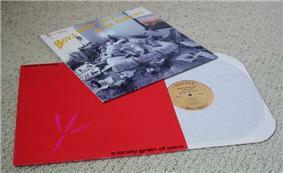 Historically, the term "album" was applied to a collection of various items housed in a book format. In musical usage the word was used for collections of short pieces of printed music from the early nineteenth century. Later, collections of related 78rpm records were bundled in book-like albums (one side of a 78 rpm record could hold only about 3.5 minutes of sound). When long-playing records were introduced, a collection of pieces on a single record was called an album; the word was extended to other recording media such as compact disc, MiniDisc, Compact audio cassette, and digital albums as they were introduced. The introduction of CDs to radio caused a crisis for a generation of DJs, who were uncertain of whether an album of music on a CD should still be called an album, as they were accustomed to 33-rpm LPs, which they considered synonymous with albums. An album is a book used for the collection and preservation of miscellaneous items such as photographs, postage stamps, newspaper clippings, visitors' comments, etc. The word later became widely used to describe a collection of audio recordings (e.g., pieces of music) on a single gramophone record, cassette, compact disc, or via digital distribution. In musical usage the word was used for collections of short pieces of music from the early nineteenth century. 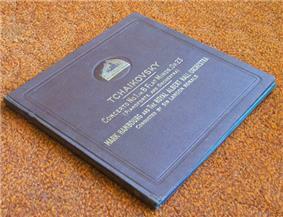 Later, collections of related 78rpm records were bundled in book-like albums. When long-playing records were introduced, a collection of pieces on a single record was called an album; the word was extended to other recording media such as compact disc, MiniDisc, Compact audio cassette, and digital albums, as they were introduced. The word derives from the Classical Latin word albus, 'white', for a tablet, later a list. As part of a trend of shifting sales in the music industry, some commenters have declared that the early 21st century experienced the death of the album. While an album may contain as many or as few tracks as required, the criteria for the UK Albums Chart is that a recording counts as an "album" if it either has more than four tracks or lasts more than 25 minutes. Sometimes shorter albums are referred to as "mini-albums" or EPs. Albums such as Tubular Bells, Amarok, Hergest Ridge by Mike Oldfield, and Yes's Close to the Edge, include fewer than four tracks. There are no formal 'rules' against artists such as Pinhead Gunpowder referring to their own releases under thirty minutes as "albums." Material (music or sounds) is stored on an album in sections termed tracks. A music track (often simply referred to as a track) is an individual song or instrumental recording. The term is particularly associated with popular music where separate tracks are known as album tracks; the term is also used for other formats such as EPs and singles. When vinyl records were the primary medium for audio recordings a track could be identified visually from the grooves and many album covers or sleeves included numbers for the tracks on each side. On a compact disc the track number is indexed so that a player can jump straight to the start of any track. On digital music stores such as iTunes the term song is often used interchangeably with track regardless of whether there is any vocal content. 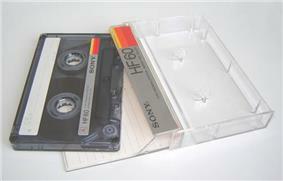 The compact disc format replaced both the vinyl record and the cassette as the standard for the commercial mass-market distribution of physical music albums. After the introduction of music downloading and the iPod, US album sales dropped 54.6% from 2001 to 2009. The CD is a digital data storage device which permits digital recording technology to be used to record and play-back the recorded music. A studio album is an album of audio recordings made up of tracks recorded in a recording studio. A studio album contains newly written and recorded or previously unreleased or remixed material, distinguishing itself from a compilation or reissue album of previously recorded material, or live recording made at a performance venue. A studio album is usually planned and scheduled in advance, and may take anywhere from a few days to several years to complete. Some studio albums may include one or more covers, occasionally as live tracks within the studio album. Studio albums may also feature guest performers or session musicians that would not usually perform live with the artist. A studio album may also be released or rereleased years after it has been recorded, or even posthumously, containing material recorded before the death of the artist. The majority of studio albums contain an abundance of editing, sound effects, voice adjustments, etc. With modern recording technology, musicians can be recorded in separate rooms or at separate times while listening to the other parts using headphones; with each part recorded as a separate track. With a theoretically infinite number of tracks available with many modern computer and hard disk based recording systems (the only limit being processing power and size of the recording medium), one song can consist of hundreds of recorded tracks, employing dozens of overdubs and complex layering of instruments. This allows studio albums to be considerably more complex than live albums, and can potentially be compiled of 'perfect' takes of the same part. Although studio albums can be recorded using large multitrack systems with many overdubs and different takes of the same instrument, many albums are still recorded live by the musician(s), in order to reproduce the feel and energy of a live performance. Often basic parts such as drums and rhythm guitar will be recorded live, then overdubs such as solos and vocals recorded later. Studio albums are often recorded, mixed and mastered at different facilities, often due to touring restrictions and time constraints of the artist or financial considerations. A studio album will often consist of songs which will be played in a different order live, or in some cases rarely or never played at all after the album or its accompanying tour. Concept albums and rock operas, such as those by Pink Floyd, are often played in their entirety live, usually in the same order as the album, and featuring the same instrumentation (and even the same sound effects) in the album's accompanying tour. Though studio albums may not include singles released at the same time, the single is usually one of the album's songs, and is meant to promote sales of the album as well as the single itself. ^ a b c Oxford English Dictionary, 2nd ed.